In my opinion, all seers and sages of yore came to more or less the same conclusion (because it's the most logical and real conclusion) about life and love. Dr. Deepak Chopra, modern day guru, author, and medical doctor who combines traditional western medicine and natural healing traditions, together with Michael Zapolin, a Kabala expert, and freelance writer Alys Yablon, has put together these Kabala cards which in essence, consist of 22 cards (one for each letter of the Hebrew alphabet) and each of these 22 cards represents a story or a Biblical character and a life lesson or meditation. There is also a little book explaining more about the Kabala, of which I know very little (it helps to be a little more informed on this subject) to help us all figure out what all the hoopla is about. With celebrities like Madonna, Britney Spears, Roseanne Barr, Demi Moore, and others living a Kabala life, you can now learn for yourself what it's all about. It's a way of life, and for my two cents, any way of life that includes spirituality and peace, is worth looking into. 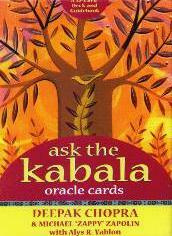 The meaning of Kabala is, according to the booklet, "The Hebrew word Kabala comes from the root Kabel, meaning "to receive". Kabala is a body of mystical writings based on a book called the Zohar (also known as "The Book of Enlightenment"), which is an interpretation of the books known together as the oral Torah". Visit Dr. Chopra's website at www.chopra.com, Mr. Zapolin's website at www.Kabala.com, and Ms. Yablon's website at www.alysyablon.com for more information. Conclusion - Very interesting and it'll get you up to speed on the Kabala craze.